How did the 1715 Rising begin? The 1715 Jacobite Rising is largely considered to be the Rising that should have worked. It had many points in its favour, including a large amount of support across Scotland and England, but it’s mismanagement and poor communication led to its ultimate demise. For many the end of the Rising may be most significant but the start is just as interesting. From as early as March in 1715 James III & VIII ( the Old Pretender) appealed to the Pope for help with a Jacobite Rising and small events throughout the year increased the tension throughout Britain. The Riot Act was brought out in response to the threat of invasion, the Habeus Corpus Act was suspended and a reward offered for the capture of James. Still it was not until 6th September 1715 that the Rising began in somewhat unorthodox fashion. A couple of weeks earlier at the end of August the Earl of Mar had travelled from London north to Braemar. Mar was one of the most powerful men in Scotland, he was governor of Stirling Castle and from 1705 was Secretary of State for Scotland. However, when King George I came into power, in 1714, he fell out of favour and left the capital, returning to his estate in Scotland where he took up the Jacobite cause. Here he summoned clan leaders to a grand hunting match. Some say there were as many as 800 men present who went hunting in Glen Quoich. At the Linn of Quoich, a natural bowl carved into the rock was filled with brandy or whisky and the men drank to a Jacobite rising. To this day the ‘Earl of Mars punchbowl’ can still be seen. Following his hunting party the Earl of Mar declared James II & VIII King of Scotland, England and Ireland at Kirkmichael in Braemar. On 6th September 1715 Mar had begun the 1715 rising. Unfortunately, he had done this without any authority and had neglected to tell James in advance of his planned uprising. Not a wise move. He also failed to recognise that there were wider plans being put into action and he had not coordinated with risings happening south of the border. To add more disaster to the event the ceremony itself did not run smooth. As the Earl of Mar raised the new standard for James III & VIII an ornamental globe fell from the top of the pole. This caused alarm amongst the many spectators and the suspicious Highlanders as it recalled the time when the head of Charles I’s staff fell as he stood trial. It was considered an omen of bad things to come. The site where the standard was raised is now home to the Invercauld Arms Hotel. The Rising had begun in a less than ideal manner and unfortunately for Mar his fortune did not turn around. He was considered a poor general and when the Rising fell apart he was held for high treason. He was exiled, his title removed and his lands forfeited. The 1715 would remain a rising of possibilities that never achieved it’s potential. Had it been better coordinated who knows what would have happened but for Mar the Rising was a failure from the beginning to the end. We hope you enjoyed this short account. As always please like, share, tweet, comment and hopefully events will be more fortuitous for you than Mar. We here at Culloden tend to put most of our focus of the 1745 Jacobite Rising, but there were a few risings before this that are worth taking a look at. We explored the 1715 Rising in our earlier post ‘1715 – The Rebellion that should have Worked’ but today we look at the small rising of 1719. With Britain at relatively peace with France the Jacobites found a new ally for this rising, Spain’s minister to the King, Cardinal Guilio Alberoni. Tensions were high between Spain and Britain as Philip V of Spain launched successful campaigns taking control of Sardinia and Sicily. In 1718 Britain responded declaring a violation of the Utrecht Treaty which then led to Spain declaring war on Britain. In order to try and stop, or at least delay, an attack Alberoni decided to stir up trouble in Britain. The original Jacobite plan had two phases. A small fleet would land in Scotland and raise support in the west to distract the British army and then the larger fleet would land in South West England to march to London and dethrone King George I. The main fleet set sail but, three weeks after leaving Spain, they encountered a storm which damaged many of the ships and left the fleet scattered. The ships were forced back to several Spanish ports to repair and wait for better weather. Unfortunately, by this time the small distraction fleet had already set sail and landed on the west coast of Scotland near Lochalsh. The men disembarked and set about raising the highland clans to join them. But, alas, another set back. Highlanders did not join the army in the numbers expected, they were wary of the plan and wanted to wait for news from the south before they committed to the cause. The men did not have enough support to make their way to Inverness and were forced to establish headquarters in the west at Eilean Donan Castle. At the beginning of May 1719, the Royal Navy sent five ships along the coast to inspect the Scottish coastline. Two patrolled off Skye whilst three headed to Lochalsh. On 10th May the latter three ships, HMS Worcester, HMS Flamborough and HMS Enterprise anchored off Eilean Donan and as evening fell the ships boat went ashore and captured the castle against very little resistance. It is said they then spent the next two days demolishing the castle with some 27 barrels of gunpowder. The Jacobites were not defeated though. Much of the main force of the army, including Spanish troops, had left Eilean Donan to try and recruit more men to their cause and were on their way to Inverness. After travelling for more than a month the Jacobite forces learnt that the main Spanish fleet would not be coming to help them. They had a little over 1,000 troops but were determined to fight. 12 miles from Eilean Donan they took defensive positions at Glen Shiel, a narrow valley which they had reinforced with basic fortifications to block the road as the Government army marched out from Inverness to meet them. In the afternoon of 10th June 1719 the Government forces made their move. Though the armies were fairly evenly matched in size the Government had the added benefit of four mortar batteries. In an attempt to weaken the enemy, the Government first used the mortars to bombard the Jacobite position. The infantry then came forward to attack the Jacobite flanks, whilst they continued to shell the enemy centre. This kept the Spanish troops pinned down in their defences on the northern slopes of the glen. After three hours of stubborn resistance, the Jacobites were eventually driven from their defensive position and forced into retreat. The Spanish men surrendered later that evening with the local highlanders fleeing to escape execution as traitors. The Jacobite lost roughly 100 men and three of their commanders, the Earl of Seaforth, Robert Roy MacGregor and Lord George Murray who was badly injured. When the expected support from the Lowlanders failed to materialise spirits fell and the rising was abandoned. The Spanish prisoners were taken to Edinburgh but were eventually released back to Spain later the same year. However, one of the peaks of the mountain in Glen Shiel on which the battle took place was named Sgurr nan Spainteach which translate as ‘The Peak of the Spainiards’ in honour of the Spanish forces who fought admirably in the battle. We hoped you enjoyed this little foray into the 1719 Rising. As always please comment, like, share, tweet and keep coming back to discover more about the many tales of the Jacobite Uprisings. This week saw the 270th anniversary of the raising of the Jacobite Standard at Glenfinnan on 19th August 1745. Last time we looked at the Princes journey as he made his way from the continent to arrive in Scotland but now we thought we’d share what happened as he made his way to Glenfinnan. Here at Culloden Battlefield we find a lot of people believe that all of the clans joined Prince Charles Edward Stuart when he arrived in Scotland and united to form the Jacobite army but this is far from the truth. In actual fact most clans were sceptical of the Prince. Having arrived in Scotland with very few men, thanks in part to the loss of his convoy ship the Elizabeth, Prince Charles was not in a particularly strong position when he first arrived. He did however have a very strong belief in his cause and a persuasive personality. Thanks to the Prince landing in such a remote part of the Highlands the Government were unaware of his presence for over a week giving the Prince time to unload his supplies and begin to make his way to Kinlochmoidart. The first authentic account of the Princes arrival did not reach Sir John Cope, Commander in Chief of the Scottish forces until 8th August. Whilst Prince Charles tried to convince men to join his cause Duncan Forbes, the Chief Justice of Scotland, went to Culloden House where he began the crucial role of organising government support in the North East and setting up independent companies, disrupting Jacobite recruitment. The first major action of the ’45 Rising occured on 16th August 1745. The Government sent reinforcements to Fort William to prepare for the Jacobite threat but Prince Charles heard of the plan and informed his supporters and 60 men were captured by the MacDonnell’s of Keppoch. 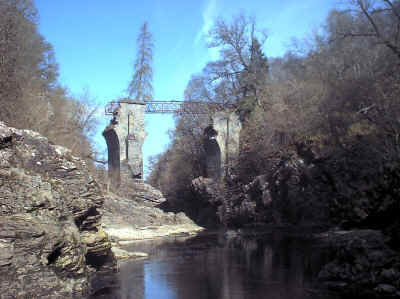 Two companies of Royal Scots government soldiers were taken prisoner at High Bridge over the River Spean. Keppoch MacDonald Highlanders later joined by some Cameron’s and MacDonald’s terrified the soldiers, who it is said were mainly raw recruits from Ireland who were not used to the Highland terrain. They fled until they reached Lagganachadrom where 50 Glengarry Highlanders met them with volleys of gunshot. Donald Cameron of Lochiel then arrived and took charge placing the soldiers in Achnacarry Inn. Royal Scots wounded in the skirmish were treated by Jacobite doctor Achibald Cameron, brother of Cameron of Lochiel. The Government prisoners were then taken with the clan to Glenfinnan where they would meet the Prince. On the 19th August Prince Charles landed at Slatach having rowed up Loch Shiel with a guard of fifty men from Clanranald and made his way to Glenfinnan. There was no one waiting for him. He began to despair but then the Highlanders appeared. Soon there were 1,500 men. Cameron of Lochiel arrived with about 600 clansmen, MacDonald of Keppoch with about 350, and MacDonald of Morar with about 150. Satisfied that he had enough support to mount his rebellion, he climbed the hill behind where the Visitor Centre now stands and raised his father’s standard. James II was proclaimed as King and Prince Charles appointed Prince Regent. The 1745 Rising had truely begun. 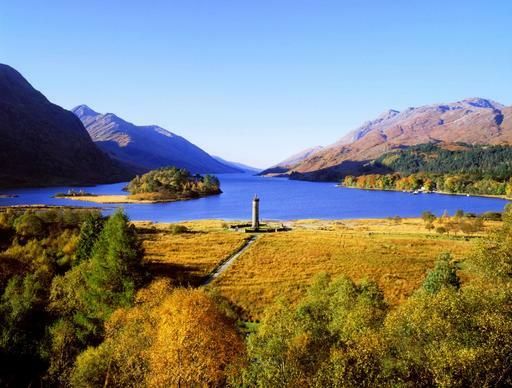 An autumn view of the Glenfinnan Monument by Loch Shiel. 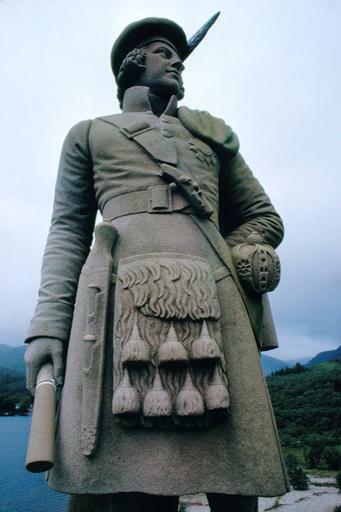 Today, the site is marked by the Glenfinnan Monument whichw as erected in 1815 by Alexander Macdonald of Glenaladale to commemorate the Jacobites who fought and fell during the 1745 uprising. Designed by James Gillespie Graham it shows a lone kilted highlander surveying the lands around him. There is also a visitors centre with a new exhibition which opened in 2013 to fully tell the story of the history of Glenfinnan. Hope you enjoyed a bit more of Prince Charles’ story and as always please like, share, tweet, comment, follow and if you have the chance head to Glenfinnan to see the monument!